This past weekend we had yet another tailgating opportunity with some amazing friends. Since we were going to be feeding a crowd, I needed to make something that would feed a lot of people, was easily transported, and was nice and warm for the cool autumn day. 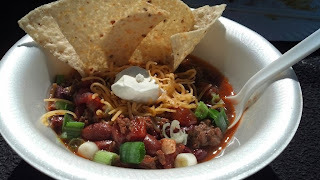 Tailgate chili was the perfect solution! This chili recipe is very easy. You can adapt the heat level to your spiciness preference. This version is just slightly spiced, since I was feeding a lot of different people. Whether you are cooking this on the stove or in the slow cooker, this recipe is perfect. 1. In a large pot, brown the beef over medium heat. Use a spatula to break the meat into small pieces as it cooks. When the meat begins to brown, add the onion, green pepper, and garlic. Continue to cook until the meat is complete brown. 2. Add the chili powder, oregano, cumin, peppers, and salt. Stir. Allow to cook for 2 minutes. 3. Add the remaining ingredients. Stir to completely combine. 4. Allow to gently simmer, slightly covered, for 1 hour, stirring often. 5. Serve with your choice of toppings. Note: If you are making this in the slow cooker, after step 1, add all ingredients to the cooker. Place on LOW and cook for 6-8 hours. This method will be a little "soupier" than the stovetop method. For our last tailgate, we wanted something different. Everyone does wings, ribs, hamburgers, but what could we make that would be unique and delicious? While looking over the meat counter at our local grocery store, we saw some beautiful thin sirloin steaks. Knowing that my husband loves a good steak sandwich, I decided to put a little spin on it and do some easy to carry steak wraps. To my relief, he was all in! On the day of the game, we broke out our tailgating grill with an interchangeable griddle top. As the food began to cook, people flocked to our tent. Several said that it "smells just like the fair" as the peppers and onions grilled to perfection. As the dish was served, the people went crazy! Some ate them simple and plain while others turned them into more of a fajita and added sour cream and toppings. No matter how you dress them, this quick and easy recipe will become a weeknight favorite for you too! 1. Combine the seasoning blend ingredients. Set aside. 2. Place the steak on a cutting board and cut into very thin strips. Move the sliced steak into a shallow dish. Cover with Worcestershire sauce; stir. Allow to sit in the refrigerator for 30 minutes. Ten minutes prior to cooking, remove from the refrigerator and allow to sit at room temperature. 3. Heat a large skillet over Medium High heat until hot. Add the butter to the pan. Once melted, add the steak, shaking excess sauce off the meat as it is added to the pan. Sprinkle with 1/2 teaspoon of the seasoning blend. Allow the steak to quickly sear, forming a slight crust, before tossing. Cook for 3 minutes. 4. Add the peppers, onions, and mushrooms to the pan. Sprinkle with an additional 1/2 teaspoon of the seasoning blend. Stir often, allowing the vegetables to soften slightly. Cook for 3 minutes. 5. Add the steak sauce to the pan. Stir. Cook for 1 minute. 6. Place the cheese slices on top of the meat mixture. Allow to melt. 7. Remove from the pan and serve in a warm flour tortilla. Apples, apples, apples. 'Tis the season for a bounty of apples and warm mugs of cider. Since it is the time of year for celebrating this delicious fruit, I am in the mood for experimenting with different recipes using apples. I have already created an Apple Cider Donut recipe, but now it was time to push the boundaries even further and expand to a barbecue sauce. 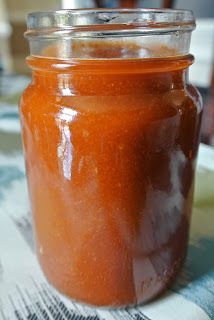 This sauce is nice and sweet with a subtle heat at the end. We used this to baste chicken as it was grilling, but it would be great with some thick cut pork chops or slathered on a slab of ribs. If you have any leftover, just allow it to cool and then store in an airtight container in the refrigerator. 1. In a small saucepan, melt the butter. Add the minced onion and garlic. Cook over Medium heat for 2-3 minutes. 2. Add the remaining ingredients. Stir well to combine. Bring back to a simmer then reduce the heat to Medium-Low. 3. Allow to gently simmer for 45 minutes, until reduced by half and thickened. If you want a thicker sauce, allow to simmer even longer. 4. Remove from the heat. Cool slightly before carefully blending to a smooth consistency. *Note: Store extras in an airtight container in the refrigerator. When entertaining guests, I am always looking for a new way to enjoy a classic dish. Everyone expects a pumpkin pie to be served at Thanksgiving gatherings, but what if you could surprise your guests with a pumpkin parfait? This dish is so easy to make and, in comparison to its traditional cousin, can be made as low fat as you desire (using fat free cool whip and sugar free pudding mix). The molasses cookies add a spiciness not often found in a traditional pie crust. If you don't like the flavor of molasses, you could always substitute ginger snaps, but the soft molasses cookies are a delicious addition. 1. In a mixing bowl, combine milk and pudding mix. Whip for 30 minutes. 2. Add the pumpkin and spices. Whip for an additional 1 minute. 3. Cover with plastic wrap, placing directly on the pudding, and refrigerate. 4. Allow to set in the refrigerator for at least 1 hour. 5. 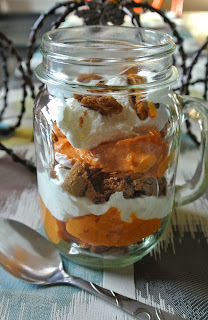 When ready to assemble, crumble half a cookie in the bottom of the glass, followed by 2 tablespoons of pumpkin pudding, and 1 tablespoon cool whip. Repeat layering., finishing with a garnish of cookie crumbles. 6. Refrigerate until ready to serve. Note: Although simple, this is a rich dessert, because of the molasses flavor. The directions make a parfait large enough for one person with a large sweet tooth. You could make smaller versions in a champagne flute or large shot glass. Sometimes there is nothing better than the taste of loaded cheese fries or potato skins. When we recently had some friends over for dinner, I couldn't decide what to make for a side dish. Should I go with humble baked potatoes? Or did the occasion call for creamy whipped potatoes? Better yet, should I make some crisp homemade chips? Finally, after much deliberation, and a longing for the smell of bacon, I decided to take all of my favorite flavors of cheese fries and turn them into a one pot side with my oven potatoes. By using the bacon drippings, the flavor is throughout the dish and adds that extra little "umph" that makes this dish so great. Don't be fooled by the simplicity of this dish. It is perfect for company or just a night alone. 1. Heat a large, cast iron skillet over medium heat. Using a pair of kitchen shears, cut the bacon into chunks directly into the skillet. Cook over medium heat to render the fat and crisp the bacon; this takes about 10 minutes. Remove the bacon from the pan, leaving the drippings behind, and place on a paper towel. Set aside. 2. Carefully place the butter/margarine into the pan with the bacon grease. Melt. 3. Gently add the cubed potatoes to the hot butter. Sprinkle with pepper. Stir to completely coat each potato chunk in butter and bacon grease. 4. Cover with aluminum foil. 5. Place in a preheated 375 degree oven. Allow to bake for 20 minutes. 6. Remove the foil and stir. Place back in the oven, uncovered, for another 40 minutes, stirring every 10 minutes. 7. Top with cheese, reserved bacon, and onions. Cover with foil. 8. Return the pan to the oven for 5 minutes. 9. Serve immediately with ketchup, ranch dressing, or sour cream. I believe when I figured out the magic combination for donuts, I may have created a monster. Tonight the monster wanted pumpkin. So this recipe not only satisfied the monster's craving, but also took advantage of the healthy benefits of pumpkin. This recipe gives you a soft, tender cake donut with a spiced pumpkin aroma. The glaze on top is reminiscent of the classic powdered donut with a hint of cinnamon. These are perfect with a nice hot cup of coffee or warm apple cider. 1. Combine all dry ingredients in the bowl of a large mixer. 2. In a separate bowl, combine the wet ingredients. 3. Slowly stream the wet ingredients into the dry with the mixer on LOW. 4. Turn the mixer to MEDIUM speed and beat for 30 seconds. 5. Thoroughly grease a donut pan. 6. Spoon 2 Tablespoons of batter into each form. 7. Bake at 325 degrees for 10 minutes. 8. Carefully remove from the pan and allow to cool on a wire rack. 9. In a small bowl, combine the glaze ingredients. 10. Invert the slightly cooled donuts and dip into the glaze. Place back on the rack and allow to cool. Note: Make sure to grease the pan well between each batch. After several failed attempts and tons of research, I have finally developed a recipe for tender, delicious donuts. This recipe takes advantage of the fall apple harvest by utilizing locally pressed apple cider from here in my home town. Apple harvesting is a big deal around here with several local orchards, dating back several generations. In fact, this weekend is the annual Apple Festival! This basic recipe holds tons of possibilities. Whether baking with the kids, making a weekend brunch, or just satisfying your late night craving for a warm donut, this recipe is sure to please! 1. In a small saucepan, pour 1 cup of apple cider. Over medium heat, simmer the cider until reduced to 1/2 a cup. Remove from heat and allow to cool. 2. In a large bowl, combine the flour, sugar, baking powder, cinnamon, nutmeg, and salt. 3. Combine the reduced cider, milk, eggs, vanilla and butter. Slowly pour into the dry ingredients. Beat until well combined and it forms a smooth batter. 4. Thoroughly grease a donut pan. 6. Bake the donuts in a 325 degree oven for 13 minutes. 7. Combine the coating sugar and cinnamon in a zip close bag. Set aside. 8. Remove donuts from the oven. Carefully lift from the pans. While still warm, place in the bag with the cinnamon sugar. Gently toss to coat. 9. 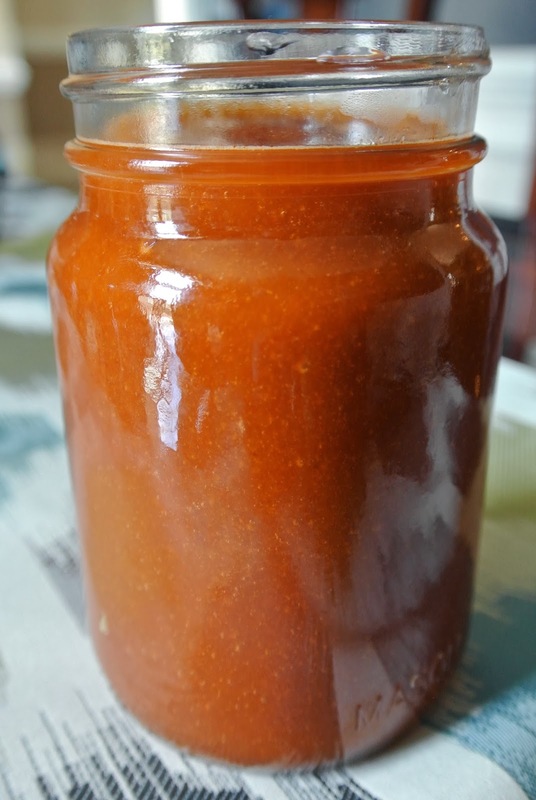 Enjoy while warm or allow to cool and store in an airtight container. This is not a recipe but a seasoning blend formula. I use this blend for everything from baby back ribs, beef ribs, and pork butts. Basically, any beef or pork we are throwing on the smoker that we want to have a little zing. I have even used it on venison roasts with excellent results. The intense heat comes out more in the beef ribs versus the pork, which I find to be counterintuitive, but it is how it is. I am thinking it is because there is more surface area with less unseasoned meat in the middle. No matter what the reason, this is a spice blend that is good to just have in the cabinet for a quick go-to flavor addition. 1. Place all spices in a bowl. 2. Whisk until thoroughly combined. 3. To use, simply sprinkle over all sides. Use your hands to massage the spice into the meat. 4. Store leftover seasoning in an airtight container.